Originally born and raised in Southern California, Brett was introduced to softball while attending California State University, Fullerton (National Champions 1986). Having transplanted to the Raleigh, NC area in 1990, he has been involved in the growth and development of softball in NC for the last 25 years. During this time, he has coached various age levels of travel softball, conducted camps/clinics, and provided private lessons. 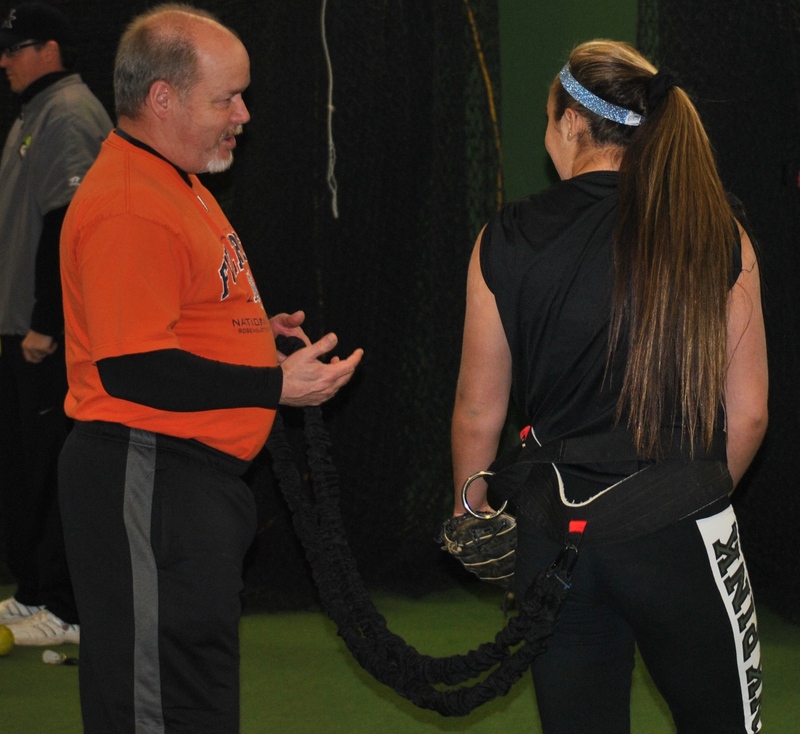 He has helped guide 2 daughters (both pitchers) through their softball careers. Both are still involved in the game today; one as a travel coach/instructor and the other as a D1 coach. Brett has a strong commitment and love for the sport of softball that can be seen in the time and effort he puts into his students. He is devoted to providing the individualized/targeted instruction that is required to help each player reach their goals and to play at the next level. His approach is focused heavily on the mental aspects of the game and covers both on and off the field development. Brett provides lessons out of the Raleigh, NC area, but travels the state to offer the best instruction available. To schedule contact Brett at: BPAnderson@FVRFastpitch.com or by phone at 919 675-5536. I first learned the mechanics of pitching back in the later 80s when my daughter wanted to learn how to pitch. She took her lessons from an instructor who had a daughter that was an All-American at the University I attended who had just won a National Title. My daughter went on to pitch in college and is now a DI coach. Even with the success of having 2 daughters who pitched, I always knew something was missing. A couple of years ago my older daughter contacted me and told me that I HAD to get up with a guy named Denny Tincher out of VA. I knew about his daughter Angela, but knew nothing about Denny. So, I looked him up online. Fluid Dynamics? Never heard of it. However, reading more about it online I knew it had to be what I was missing all these years. And so, I contacted Denny and based on my daughter’s referral, he invited me to attend one of his sessions so that I could see what this Fluid Dynamics was all about. It didn’t take long for me to realize that, even though the terminology was different, that we both believed in the same basic principles of pitching. But did it offer me what I felt I was missing all this time? YES!! The way that Denny incorporated the female anatomy into pitching… where it was strongest… weakest… how their joints worked differently than the male anatomy… and how the ‘traditional’ way of teaching a female to pitch was wrong (which inherently I always knew) and why Fluid Dynamics was better. EUREKA!!! I had found it. The missing part of my pitching knowledge/philosophy. This WAS the answer. Having now re-invented my approach to pitching, I have seen the evidence in my own pitchers … all of whom now throw with Fluid Dynamics. Pitchers who have come to me having thrown with pain in the past… are now pain free. Pitchers who threw with little or no power… now throw with explosive power. I know that there are many methods of instruction out there. However, not only is Fluid Dynamics the best way to pitch… in my opinion it’s the ONLY way to pitch. When one of our current Certified Instructors recommends another person for our program, we pay attention. Brett Anderson was put forth as someone with an extensive background in softball on both the west and east coasts, so we wanted to meet him. After working extensively with Brett, we found someone who shared the same philosophy. Brett wasn’t happy with many of the traditional methods and had already begun to explore alternatives, so his transition was incredibly easy. As we explained ways to eliminate barriers, enhance performance, and better ways to help kids succeed more quickly, we would often hear Brett say “aha” as he filled in some of the missing pieces of the puzzle. Before long he was helping us find ways to connect the dots in ways we had not considered. Experience, innovation, enthusiasm. That’s Brett.